This entry was posted on Sunday, July 12th, 2009 at 2:03 pm	and is filed under Women in Islam. You can follow any responses to this entry through the RSS 2.0 feed. Both comments and pings are currently closed. 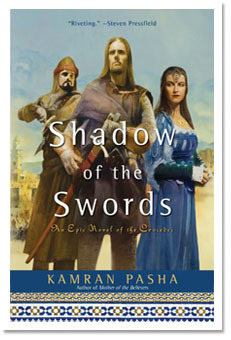 Kamran, I am going to order your book! I spent most of my childhood in Africa and have travelled a great deal the past five years, meeting many women of different backgrounds and faiths. There is no doubt in my mind (A white English/Norwegian) that Eurocentric attitudes predominate. We are the colonialists who never thought that one day, the countries whom we colonised would have citizens who wanted to better themselves and given their children a (possibly) better life, by coming to live in our countries! There was also a big debate on the burqa last year in Britain, prompted by the Deputy Prime Minister. As time goes on, we seem to become less tolerant, rather than more, with the economic pressures that many of us are now facing. It’s not for us to say what people should or should not wear, if they are happy wearing it. If they aren’t, then that is a different issue. I often seen women wearing burqas in central London. Yes, they stand out, because there are so few of them, but I can tell by their body language that they are very self confident. So, let’s leave well alone, as long as people are kind and respect one another, that is enough. Wonderful entry, really wonderful… Thank you for showing such unusual sensitivity to women’s concerns as well as for the very interesting history lesson. Thank you also for speaking up about that terrible incident in Germany which everyone is trying to ignore. I have looked in vain to references to it in the other blogs that I read (supposedly liberal blogs). Is there any chance that this article has been published somewhere in French? I would like to send it to my francophone friends and I would prefer to link them to the original rather than send a rough translation. Kamran last night at Pakistan Independence day, I liked your speech though it wasn’t nice asking you to cut down the speech while you were reading the most important part of history. Burqa or veil is more cultural than Islamic thing. I totally agree with the history of veil. Since Muslims are using it that makes it controversial in the western world. Hazrat Ayesha is the complete role model for every Muslim women with all the leadership qualities. Now a days I personally think that we have majority of muslim women divided in two extreme types. one is very extreme about Parda and Hijab they don’t want to even think about masculine world . For them every thing is Haram, according to their vision masculine and feminine should be in two direction unless they are Mehram(Mullah’s Islam). The other class can’t even define the difference between masculine and feminine world. Modern feminism/Masculine almost erase the line between two genders. According to Quran And Ahadith there lifestyles are explained according to their psychology. I personally think that we need to educate our muslim women that the ban shouldn’t stop them in moving forward women can be covered by dressing modestly. I have met many women with completely covered body but filthy mind. Burqa or Hijab debate is based on a hatred of the other that arises from racism toward its muslim immigrant population. Interesting but I would like to point out a slight problem with your reasoning about niqab not being religiously mandated, as you said that it predates Islam. This logic is flawed since also hijab predates Islam but no one will argue its not required. Both were co-opted and (for those arguing for niqab) they will say that one thing that was only for the upper class was made obligatory for everyone, a form of egalitarianism. after reading what you wrote I want to tell you that it is truly instructive particularly when you wrote about the origins of christianity and how it is what it is today. I am a muslim and very interested in other religions and I wish my jews and christians brothers and sisters- children oh Abraham- as well as non believers will understand the beauty of islam. I am french, I grew up in france my parents are morrocan immigrants.As such I do confirm what you wrote regarding the position of my country towards the veil and the niqab. However one must be in peace with himself, I think that it is only by being the best muslims that we can that is to say loving each other, be kind to each other, being polite that people can see who we really are. I thank you a lot for opening our minds with your talent.